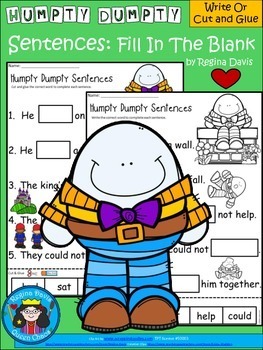 Here is a simple, 1 page activity for your students to practice reading sentences when you are reading the nursery rhyme, Humpty Dumpty. 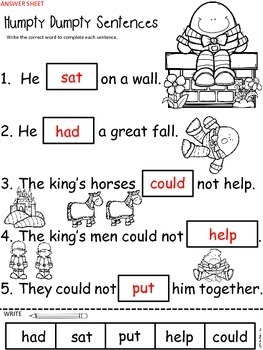 Your students can either write in the missing word, or cut and glue the missing word into the sentence to complete the sentence. This activity is included in a bundled set help you save $. I have given you the option of printing in either color or black and white. Please view the mini viewing windows as the ENTIRE download can bee seen there. The only addition is another Answer Sheet for the Write The Words option, and the color or black and white options for what is seen in the mini windows.